What do all 3 of these things have in common? And what in the world do they have to do with computer processors (ok modern oscilloscopes and cell phones DO have CPUs in them but spark plugs?). Tektronix was started here in Oregon in 1946 making oscilloscopes and other test equipment. Throughout the last 70 years they have continued to do so, but along the way they also began to make everything needed to manufacture the final equipment they sold. Design/simulation software, PCB manufacturing, IC manufacturing, displays, and even the packaging used for IC’s. In recent years many of these vertically integrated operations have been spun off, but they do still maintain some. When an IC manufacturer (such as Intel, AMD, etc) designs/builds an IC what they typically are creating (or having made in the case of fabless companies) is the silicon die itself. This little piece of silicon contains the millions of transistors needed to perform whatever task its made for, but for most uses that silicon die needs to be packaged to be useful. A sliver of silicon is hard to work with and integrate into designs, a package provides the routing of wire/leads to the die, as well as protects it from the environment, while dissipating any heat it generates. IC manufactures do not typically make their own packages, they are either contracted out or bought off the shelf. Tektronix is one of several companies that makes and sells IC packages. 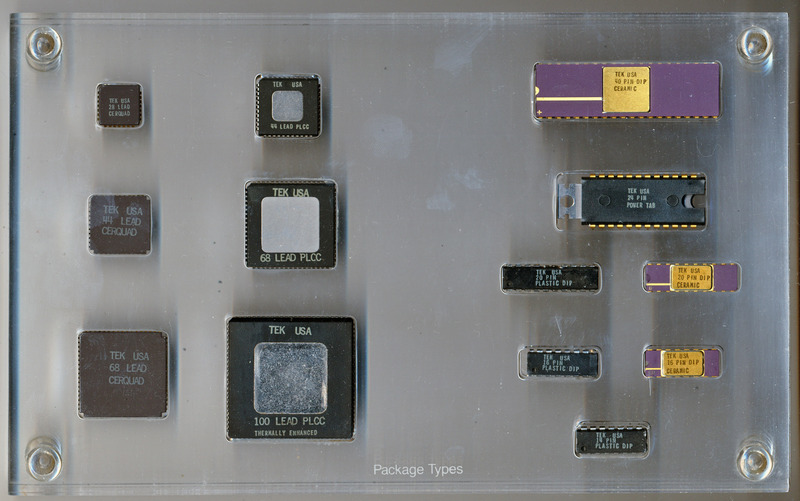 The pictured display is a sample of some of the packaging types they offered. You can recognize some of the more common packages, as well as some more specialty ones such as the ‘POWER TAB’ that was used in analog equipment frequently (like audio amplifiers etc). Tektronix isn’t the only company that offers packages for IC. Perhaps the two largest are NGK and Kyocera. Both have extensive experience with ceramics, a material very useful in IC packages. Developing high strength, high temperature ceramics for spark plugs, isn’t so much different from designing the same for a high end processor. Kyocera started life making ceramic insulators, well before ever getting into cell phones (in 2000) and ceramic packaging continues to be their core business. 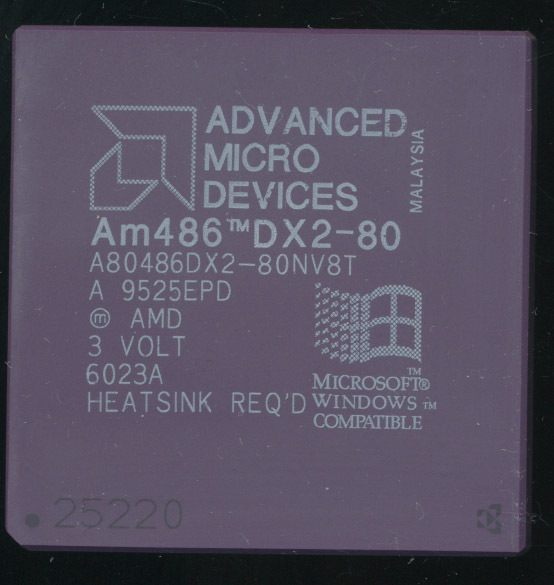 Often times assembly and test of a IC is handled by yet another company. 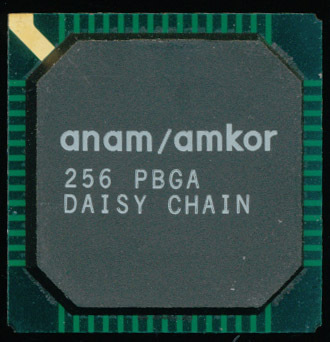 Many companies (such as Amkor) entire business is based on taking IC dies from one company, assembling them into packages from another, testing them, and shipping them. 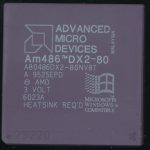 So next time you look at a CPU and read its makers name boldly written on its top, there is a good chance that that name had but one part in that IC.